HICKORY, NC (November 3, 2016) – Transportation Insight Founder and Chairman Paul Thompson was the speaker for the 58th Harlan E. Boyles Distinguished Lecture Series at Appalachian State University in Boone, NC. Thompson is the visionary leader behind six highly successful North American companies, including his portfolio’s flagship brand, Transportation Insight, a multi-modal global lead logistics provider and business strategist. Transportation Insight is a nine-time Inc. 500|5000 honoree, ranked among the Top 50 Global 3PLs, and recognized in the top revenue tier of North Carolina’s privately held companies with a No. 4 ranking. The company was also recently designated a U.S. EPA SmartWay® Excellence Award recipient. Thompson, who founded Transportation Insight in 1999, is the inaugural Grant Thornton North Carolina 100 Cultural Leader of the Year and was an award recipient for the 2015 EY Entrepreneur of the Year® Southeast Region. He was instrumental in establishing the Transportation Insight Center for Entrepreneurship at ASU’s Walker College of Business. The College of Business hosts the bi-annual Boyles lecture. Thompson delivered his lecture “The Seven Attributes of a Great Leader” in the Holmes Convocation Center Friday, Oct. 28 for an on-site audience of more than 1,000 attendees, including supply chain management and business analytics students, student entrepreneurs, Appalachian State University faculty and staff and regional business leaders. Thousands more had access to the presentation through online streaming. In addition to delivering the Boyles Distinguished Lecture, a morning breakfast allowed Thompson to engage with students attending Appalachian State University and Winston-Salem State University and pursuing careers in supply chain management and business analytics. An industrial engineering honor graduate from University of Arkansas, Thompson notes the dynamic changes that have occurred in transportation logistics during his three decades working in the industry. A business that once largely revolved around “blue-collar” work and trucks, trailers and terminals, is now one that is highly reliant on intellectual capital. Transportation Insight and its recently launched transactional freight division, BirdDog Logistics, are relying on students considering those careers. The company aims to expand its workforce by nearly 20 percent during the next year, Thompson says, adding that of four-year degree holders currently employed at Hickory’s corporate campus, about 20 percent attended Appalachian State. The company’s workforce demands are driven by growth goals of becoming North America’s foremost logistics services provider and achieving $3-$5 billion in revenue by Jan. 1, 2020. With workforce needs in mind, Thompson and Transportation Insight work hard to establish a corporate culture that attracts the next generation of intellectual capital that will fuel transportation logistics and supply chain management into the future. The culture is grounded in a mission to create a sustainable company that delivers significance within the company walls and its surrounding communities. Central to that culture, is the Transportation Insight’s new corporate campus in downtown Hickory and near amenities that are highly sought by both new and existing members of the workforce. The 70,000 square-foot rehabilitated mill includes an athletic field and cafeteria, as well as future plans for a full-sized gymnasium with basketball court and employee exercise facilities. The campus – like Transportation Insight’s company practices that support employee development and advancement – mirrors the company’s continuous improvement mindset that it applies to client operations. Named in honor of six-time North Carolina State Treasurer and 49-year public servant, Harlan E. Boyles, the lecture series is held each semester since its start in Spring 1988. 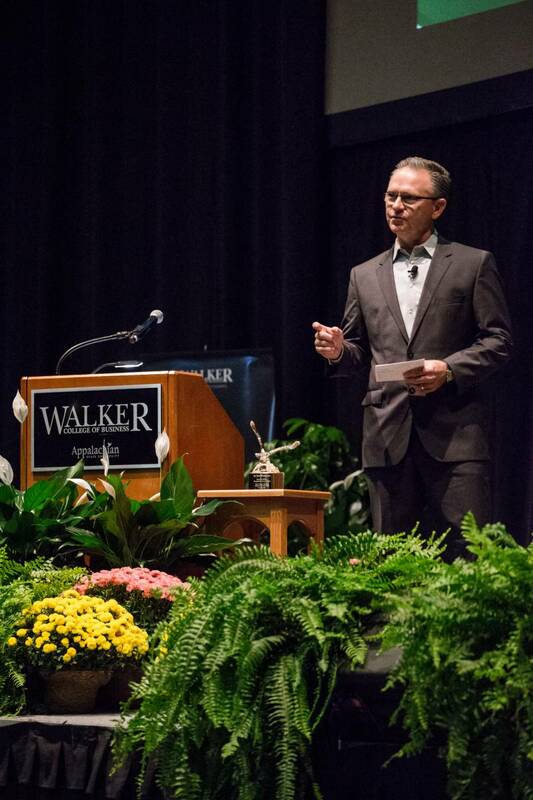 A native of Lincoln County, Boyles was dedicated to education and was intimately involved with Appalachian State University and the Walker College of Business, where he shared his experience, advice and counsel with hundreds of students and future business leaders. Past speakers include Wells Fargo & Co. Senior Executive Vice President of Wealth and Investment Management David Carroll, BBDO New York President and CEO John Osborn, State Employees Credit Union President and CEO Jim Blaine, Blue Cross and Blue Shield of North Carolina President and CEO, BB&T CEO Kelly King, and Duke Energy CEO James Rogers.